Offering a seasonal outdoor pool this Branson inn has an adjoining theatre for comedy and country music. Branson Landing is 4.9 km away. Free WiFi access is available. 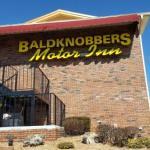 All rooms feature a cable TV and a separate seating area at Baldknobbers Motor Inn. Extras include a coffee machine and an iron. The Branson Baldknobbers Inn has a gift shop and vending machines for snacks and refreshments. The property offers free parking. The Baldknobbers restaurant offers local cuisine for breakfast lunch and dinner. Steaks chicken and catfish are always featured on the menu. The motel is 5.5 km from Silver Dollar City and 700 m from the Titanic Museum. Hiking and trails are 6 minutesâ?? drive away at the Henning Conservation Area.